This was on one of the broken columns at Laodicea. 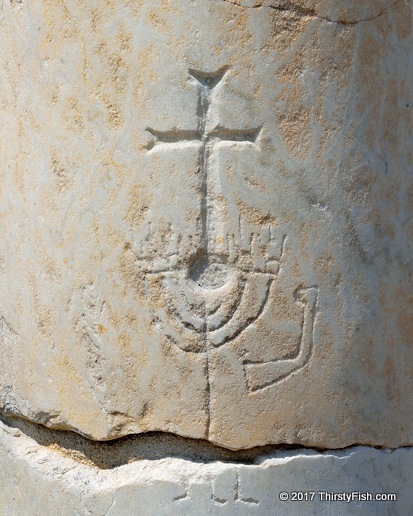 I would guess that the seven-branched menorah was graffitied in on the marble column first and the Christian Cross was carved at a later date. Laodicea was originally founded by Hellenistic Seleucid king Antiochus II Theos around 260 B.C. in honor of his first wife Laodice, whom he later divorced. The city was originally called Diospolis, "The City of Zeus". Antiochus III the Great relocated many Jewish families to the city from Babylonia. With its large Jewish population, the city became an early seat of Christianity and is one of the Seven churches of Asia mentioned in the Book of Revelation.